Size: Select 28" to 36" 36" to 44" Youth 22" to 28"
My waist size is 35, and I ordered the 28 -36. It is too small. I can just make it fit, so rather than expense of returning, I'll give it a try. Go for the larger one if your waist is near 36. Otherwise its a much sturdier design than my old belt, it looks to be an excellent product. This is a great belt. I know many riders don't use them but this keeps fatigue away and lets me ride longer. Keeps the back from hurting as well. Highly recommend it. the bands ripped after my race with it. first time racing with it and very dissapointned. will not buy again. Once you young humans get into the aging process weird things start to happen...Age is a constant moment in constant movement...thus you need a little help to keep all the goodies inside from moving too much from their intended location. Oh thank the powers that be to the saving grace of stuff that can fit under a shirt so I can still look cool and not beat myself up when attempting to practice and get some exercise....If you are thinking, I don't have one...get one for your many island nations inside of the lovely body that just want a little hug. Very happy with the product and the customer service ! 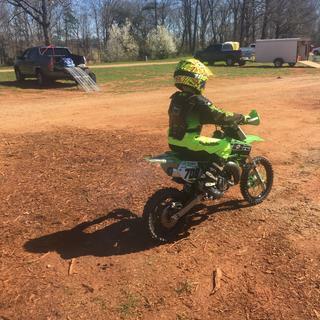 My 10 year old son is just starting out riding - this was a great place to get all that he needed ! Have been using mine for over three years and am just now ordering a replacement. Served me well for three race seasons, it's a little stretched out and beat up now....but it held up great for a inexpensive belt. Ordering a fresh one to replace it! This kidney belt is a great value for the money. It fits well and looks good. Purchased for my son, he's 5 now 6, and this belt fits perfectly. Belt has held up perfectly through one race season and we are onto the second year. Very comfortable to wear. Great support. Great low-pro kidney belt. Offers good support and tucks into pants nicely. I've had this belt for about 5 years now, and I've never had any issues with it. I've got about 150 hours of riding time with it, and it still holds good elasticity. The Velcro still works well, and the main rubber in the back is still all holding together. I wash this belt fairly frequently in a machine wash with the rest of my gear, and then let it air dry. I've seen other belts come apart from wash, but I have yet to have any issues or complaint with this belt. Thanks Rocky Mountain! I love this so much I wear it everywhere. It helps my lower back pain and helps with posture, not to mention helps with long and short riding days. Fox nailed it out of the park! I'm a Big guy & I got the biggest one,it fits & seems to be a good Kidney belt..I've never used them before.. but I like it. The kidney belt does it's job. It is a little bit hot and likes to slide up if you wear it under your jersey. Otherwise it really does work, it keeps my kidneys from hurting. Use it for adventure rides that span multiple days. Helps the lower back. good kidney belt, very comfortable. Great product when new. yes comfortable even at long trips. DOWN FALL, after so much usage the Velcro snaps and opens while riding. Considering a well known company, you would expect a quality product. Had to improvise with a new Velcro. If this does not work its garbage. Not so happy about the product. It works great and is very comfortable. Great product by fox as always. Very open and breathable. Cannot yet attest to durability, but it does what it should. A bit pricey because of the brand. Im a 34-36 and went for the larger size. Fits perfect. Really nice product. Fits well. Excellent finish. comfy and does its job! Great Kidney belt, comfy and does the job. Not to big and not to small and very adjustable. Great belt. Back does not hurt any more after a race. Fits well. Velcro is strong and wide enough. Back fatigue is gone! its tight makes me feel like a girl putting on a girdle. Helps your back a ton everyone needs one!! I have used this brand for years and love it. I bought this thinking it will help keep my back in check. It does hlep with some back support but it crumples up in the stomach area and stabs you right under the ribs. THe benifit does not outweigh the pain. This is not a product for us big boys. I wouldn't buy this belt again. This belt is great! Unlike most belts it has a great mix of materials that allow the back brace to breath on your lower back. I've owned this kidney belt for several years and it works and wears very well. I will buy another one of these. 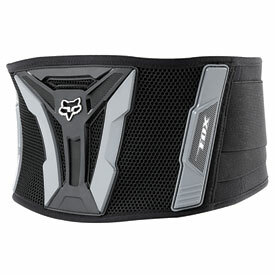 This is a good kidney belt that supports my lower back well. I'm a size 34 in regular pants and the fit was a little small but it still works. Recommend you get the larger one if you're bigger than 34 waist. Belt latches on well, feels good while on, and cleans up easy, would like it to be a little wider. Velcro holds really firm and has never come loose. Do recommend. My son is 10 and fairly short, weighs about 66lbs, this belt fit him however it was excessively too tall on his torso, it rode up his rib area. Maybe better fit for a larger child. When I first looked at this belt I thought that it wouldn't be rigid enough to do the job but after two days riding it has definitely done it's job with no kidney ache or back pain and you hardly notice it's there. Works Great, keeps ur back nice and tight. deff feel a lot better after a long day of riding. you WILL see a difference. If you do not have a kidney belt get one. you will love it. I've been using this belt for about six months now and it's holding up well (just some minor fraying on one side). I would buy again. Sturdy belt for the price. As a woman mountain biker, would this be considered a unisex item? BEST ANSWER: YES I am a female and I wear it just fine. it could be, but it's extremely light weight. i expected smth. a little sturdier to be honest with you. i purchased it for a child, who will eventually grow out of it so it's a temporary thing. but i wouldn't purchase it for myself. I would say yes it could very well be unisex item. I bought this item recently and it's a great fit. It is very comfortable when you are wearing it for long periods of time. Yes, I have been riding and racing for 40 years and I would consider as a unisex for sure. Well I would think so. I use it on dirtbike and Im very happy with it, I recomendid. Yes, this is a unisex item. Adjustability is up to min and max size. If you have hips, no it isn't as comfortable as it could be. Yes. It's not very stiff but it does support. I believe the fit of this item is unisex. i am a 34-36 waist. what size should I buy? BEST ANSWER: Defintely the larger 36+ one. I bought the 28-36 one, too small for me with a 35 inch waist. Defiantly the XL size. Would recommend everyone go size up.